THE Grand Chartreuse has exceeded my expectations; it is more wonderfully wild than I can describe, or even you can imagine. It has possessed me to such a degree, that I can at present neither think, speak, nor write upon any other subject. June 5th, I left Geneva; and, after passing through a succession of valleys, between innumerable mountains, and after crossing a variety of picturesque bridges, thrown over the streams which water them, arrived at Aix, in Savoy, famous for its baths; which, as disagreeable things are generally the most salutary, ought, doubtless, to be of the greater efficacy; for more uninviting objects one seldom meets with. Advancing beneath a little eminence, partly rock, partly wall, we discovered the principal bath, filled with a blue reeking water, whose very steam is sufficient to seethe one, without further assistance. Scarce had we stood looking on it a minute, before down dashed three or four dirty boys, as copper-coloured as the natives of Bengal; who, by splashing us all over, and swimming about à la crapaudine, convinced us, that it was not their fault, if we would not have companions in the delights of bathing. I soon hurried away from this salubrious cauldron; and, stepping into a little chapel hard by, where they were singing vespers, prayed heartily to the Virgin, that I might never need the assistance of those wonder-working waters, over which she presides. As there was but little company in the town, and little amusement, I went to bed at nine, and rose at four the next morning, that I might reach, before sun-set, the celebrated road which Charles Emanuel had cut through a rocky mountain. My plan succeeded; and after dining at Chambery (a place scarce worth speaking of to you) and passing by a cataract that throws itself from a lofty steep, I began to discover a beautiful woody vale, terminated, on one side, by the hallowed cliffs of the Grand Chartreuse; and, on the other, by the mountain, which Charles Emanuel had perforated in so extraordinary a manner. The sun was just sinking in a brilliant cloud, which seemed to repose on a swelling hill covered with cattle, when we quitted the chearful valley, and began to descend between two ridges of precipices, that, at some distance, had the appearance of towering ramparts. Pursuing our route, we found ourselves in a deep cleft, surrounded by caverns, echoing with a thousand rills, which trickle down their sides, and, mingling their murmurs with the rattling of our wheels, and the steps of our horses, infinitely repeated and multiplied, formed all together the strangest combination of sounds that ever reached my ears. The road itself is admirably cut, and hewn with such neatness, that, were it not for the savage and desolate air of its environs, I should have imagined myself approaching some grand castle, or considerable city. Towards the summits of the precipices, that in some places rise to a majestic elevation (the two sides here and there, nearly meeting in an arch) hung light woods of glossy green, which, being agitated by a gentle wind, cast a moving shadow over the cleft beneath; and, at a little distance, gave our road the appearance of a chequered pavement. Having wound through the bosom of the mountain for some time, I was struck by the unexpected appearance of a grand edifice, resembling a vast portal, supported by doric pilasters, and crowned with an ornamented pediment. Upon my nearer approach, I found a smooth tablet, filling up the space I had allotted for an entrance, on which was engraven a pompous Latin inscription, setting forth, with what incredible labour and perseverance his majesty Charles Emanuel the Second, of Sardinia, Cyprus, and Jerusalem, king, had cut this road through the mountain; which great enterprize, though unattempted by the Romans, and despaired of by other nations, was executed under his auspices. I very sincerely wished him joy; and, as the evening was growing rather cool, was not sorry to perceive, through an opening in the rocks, a wide-extended plain, interspersed with meadows embosomed by woods, in which I distinguished Les Echelles, a village, where we were to lie, with its chimneys smoking, under the base of one of the Carthusian mountains; round which had gathered a concourse of red and greyish clouds. The twilight was beginning to prevail when we reached our inn, and very glad I was to leave it at the first dawn of the next day. We were now obliged to abandon our coach; and, taking horse, proceeded towards the mountains, which, with the valleys between them, form what is called the Desert of the Carthusians. In an hour's time we were drawing near, and could discern the opening of a narrow valley overhung by shaggy precipices, above which rose lofty peaks, covered to their very summits with wood. We could now distinguish the roar of torrents, and a confusion of strange sounds, issuing from dark forests of pine. I confess at this moment I was somewhat startled. I experienced some disagreeable sensations, and it was not without a degree of unwillingness that I left the gay pastures and enlivening sunshine, to throw myself into this gloomy and disturbed region. How dreadful, thought I, must be the despair of those who enter it never to return! But after the first impression was worn away all my curiosity redoubled; and desiring our guide to put forward with greater speed, we made such good haste, that the meadows and cottages of the plain were soon left far behind, and we found ourselves on the banks of the torrent, whose agitation answered the ideas which its sounds had inspired. Into the midst of these troubled waters we were obliged to plunge with our horses, and, when landed on the opposite shore, were by no means displeased to have passed them. We had now closed with the forests, over which the impending rocks diffused an additional gloom. The day grew obscured by clouds, and the sun no longer enlightened the distant plains, when we began to ascend towards the entrance of the desert, marked by two pinnacles of rock far above us, beyond which a melancholy twilight prevailed. Every moment we approached nearer and nearer to the sounds which had alarmed us; and, suddenly emerging from the woods, we discovered several mills and forges, with many complicated machines of iron, hanging over the torrent, that threw itself headlong from a cleft in the precipices; on one side of which I perceived our road winding along, till it was stopped by a venerable gateway. 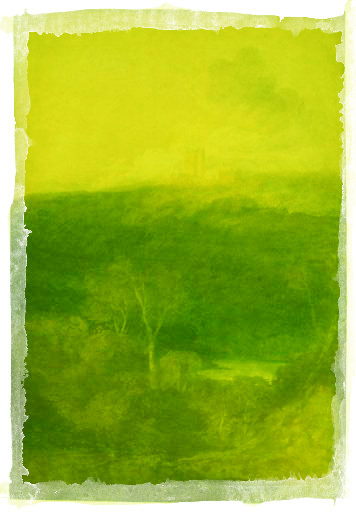 A rock above one of the forges was hollowed into the shape of a round tower, of no great size, but resembling very much an altar in figure; and, what added greatly to the grandeur of the object, was a livid flame continually palpitating upon it, which the gloom of the valley rendered perfectly discernible. The road, at a small distance from this remarkable scene, was become so narrow, that, had my horse started, I should have been but too well acquainted with the torrent that raged beneath; dismounting, therefore, I walked towards the edge of the great fall, and there, leaning on a fragment of cliff, looked down into the foaming gulph, where the waters were hurled along over broken pines, pointed rocks, and stakes of iron. Then, lifting up my eyes, I took in the vast extent of the forests, frowning on the brows of the mountains. It was here first I felt myself seized by the Genius of the place, and penetrated with veneration of its religious gloom; and, I believe, uttered many extravagant exclamations; but, such was the dashing of the wheels, and the rushing of the waters at the bottom of the forges, that what I said was luckily undistinguishable. I was not yet, however, within the consecrated enclosure, and therefore not perfectly contented; so, leaving my fragment, I paced in silence up the path, which led to the great portal. When we arrived before it, I rested a moment, and looking against the stout oaken gate, which closed up the entrance to this unknown region, felt at my heart a certain awe, that brought to my mind the sacred terror of those, in ancient days going to be admitted into the Eleusinian mysteries. My guide gave two knocks; after a solemn pause, the gate was slowly opened, and all our horses having passed through it, was again carefully closed. I now found myself in a narrow dell, surrounded on every side by peaks of the mountains, rising almost beyond my sight, and shelving downwards till their bases were hidden by the foam and spray of the water, over which hung a thousand withered and distorted trees. The rocks seemed crowding upon me, and, by their particular situation, threatened to obstruct every ray of light; but, notwithstanding the menacing appearance of the prospect, I still kept following my guide, up a craggy ascent, partly hewn through a rock, and bordered by the trunks of ancient fir-trees, which formed a fantastic barrier, till we came to a dreary and exposed promontory, impending directly over the dell. The woods are here clouded with darkness, and the torrents rushing with additional violence are lost in the gloom of the caverns below; every object, as I looked downwards from my path, that hung midway between the base and the summit of the cliff, was horrid and woeful. The channel of the torrent sunk deep amidst frightful crags, and the pale willows and wreathed roots spreading over it, answered my ideas of those dismal abodes, where, according to the druidical mythology, the ghosts of conquered warriors were bound. I shivered whilst I was regarding these regions of desolation, and, quickly lifting up my eyes to vary the scene, I perceived a range of whitish cliffs glistening with the light of the sun, to emerge from these melancholy forests. On a fragment that projected over the chasm, and concealed for a moment its terrors, I saw a cross, on which was written VIA COELI. The cliffs being the heaven to which I now aspired, we deserted the edge of the precipice, and ascending, came to a retired nook of the rocks, in which several copious rills had worn irregular grottoes. Here we reposed an instant, and were enlivened with a few sunbeams, piercing the thickets and gilding the waters that bubbled from the rock, over which hung another cross, inscribed with this short sentence, which the situation rendered wonderfully pathetic, O SPES UNICA! the fervent exclamation of some wretch disgusted with the world whose only consolation was found in this retirement. We quitted this solitary cross to enter a thick forest of beech trees, that screened in some measure the precipices on which they grew, catching however every instant terrifying glimpses of the torrent below. Streams gushed from every crevice in the cliffs, and falling over the mossy roots and branches of the beech, hastened to join the great torrent, athwart which I every now and then remarked certain tottering bridges, and sometimes could distinguish a Carthusian crossing over to his hermitage, that just peeped above the woody labyrinths on the opposite shore. Whilst I was proceeding amongst the innumerable trunks of the beech trees, my guide pointed out to me a peak, rising above the others, which he called the Throne of Moses. If that prophet had received his revelations in this desert, no voice need have declared it holy ground, for every part of it is stamped with such a sublimity of character as would alone be sufficient to impress the idea. Having left these woods behind, and crossing a bridge of many lofty arches, I shuddered once more at the impetuosity of the torrent; and, mounting still higher, came at length to a kind of platform before two cliffs, joined by an arch of rock, under which we were to pursue our road. Below, we beheld again innumerable streams, turbulently precipitating themselves from the woods and lashing the base of the mountains, mossed over with a dark sea green. In this deep hollow such mists and vapours prevailed as hindered my prying into its recesses; besides, such was the dampness of the air, that I hastened gladly from its neighbourhood, and passing under the second portal beheld with pleasure the sunbeams gilding the Throne of Moses. It was now about ten o'clock, and my guide assured me I should soon discover the convent. Upon this information I took new courage, and continued my route on the edge of the rocks, till we struck into another gloomy grove. After turning about it for some time, we entered again into the glare of daylight, and saw a green valley skirted by ridges of cliffs and sweeps of wood before us. Towards the farther end of this inclosure, on a gentle acclivity, rose the revered turrets of the Carthusians, which extend in a long line on the brow of the hill; beyond them a woody amphitheatre majestically presents itself, terminated by spires of rock and promontories lost amongst the clouds. The roar of the torrent was now but faintly distinguishable, and all the scenes of horror and confusion I had passed were succeeded by a sacred and profound calm. I traversed the valley with a thousand sensations I despair of describing, and stood before the gate of the convent with as much awe as some novice or candidate, newly arrived to solicit the holy retirement of the order. As admittance is more readily granted to the English than to almost any other nation, it was not long before the gates opened, and whilst the porter ordered our horses to the stable, we entered a court watered by two fountains and built round with lofty edifices, characterized by a noble simplicity. The interior portal opening, discovered an arched aisle, extending till the perspective nearly met, along which windows, but scantily distributed between the pilasters, admitted a pale solemn light, just sufficient to distinguish the objects with a picturesque uncertainty. We had scarcely set our feet on the pavement when the monks began to issue from an arch, about half way down, and passing in a long succession from their chapel, bowed reverently with much humility and meekness, and dispersed in silence, leaving one of their body alone in the aisle. The father Coadjutor (for he only remained) advanced towards us with great courtesy, and welcomed us in a manner which gave me far more pleasure than all the frivolous salutations and affected greetings so common in the world beneath. After asking us a few indifferent questions, he called one of the lay brothers, who live in the convent under less severe restrictons than the fathers, whom they serve, and, ordering him to prepare our apartment, conducted us to a large square hall with casement windows, and, what was more comfortable, an enormous chimney, whose hospitable hearth blazed with a fire of dry aromatic fir, on each side of which were two doors that communicated with the neat little cells destined for our bed-chambers. Whilst he was placing us round the fire, a ceremony by no means unimportant in the cold climate of these upper regions, a bell rung which summoned him to prayers. After charging the lay brother to set before us the best fare their desert afforded, he retired, and left us at full liberty to examine our chambers. The weather lowered, and the casements permitted very little light to enter the apartment: but on the other side it was amply enlivened by the gleams of the fire, that spread all over a certain comfortable air, which even sunshine but rarely diffuses. Whilst the showers descended with great violence, the lay brother and another of his companions were placing an oval table, very neatly carved, and covered with the finest linen, in the middle of the hall; and, before we had examined a number of portraits which were hung in all the panels of the wainscot, they called us to a dinner widely different from what might have been expected in so dreary a situation. The best fish, the most exquisite fruits, and a variety of dishes, excellent, without the assistance of meat, were served up, with an order and arrangement that shewed it was not the first time they had entertained in the noblest manner. But I was not more struck with the delicacy of the entertainment, than with the extreme cleanliness, and English-like neatness, of the whole apartment and its furniture. A marble fountain, particularly, gave it a very agreeable air, and the water that fell from it into a porphyry shell was remarkable for its clearness and purity. Our attendant friar was helping us to some Burgundy, of the happiest growth and vintage, when the coadjutor returned, accompanied by two other fathers, the Secretary and Procurator, whom he presented to us. You would have been both charmed and surprised with the cheerful resignation that appeared in their countenances, and with the easy turn of their conversation. The Coadjutor, though equally kind, was as yet more reserved: his countenance, however, spoke for him without the aid of words, and there was something so interesting in his manner, such a mixture of dignity and humility, as could not fail of inspiring respect and admiration. There were moments when the recollection of some past event seemed to shade his countenance with a melancholy that rendered it still more affecting. I should suspect he formerly possessed a great share of natural vivacity (something of it being still, indeed, apparent in his more unguarded moments); but this spirit is almost entirely subdued by the penitence and mortification of the order. The Secretary displayed a very considerable share of knowledge in the political state of Europe, furnished probably by the extensive correspondence these fathers preserve with the three hundred and sixty subordinate convents, dispersed throughout all those countries where the Court of Rome still maintains its influence. In the course of our conversation they asked me innumerable questions about England, where formerly, they said, many monasteries had belonged to their order; and principally that of W. which they had learnt to be now in my possession. The Secretary, almost with tears in his eyes, beseeched me to revere these consecrated edifices, and to preserve their remains, for the sake of St. Hugo, their canonized prior. I replied greatly to his satisfaction, and then declaimed so much in favour of Saint Bruno, and the holy prior of Witham, that the good fathers grew exceedingly delighted with the conversation, and made me promise to remain some days with them. I readily complied with their request, and, continuing in the same strain, that had so agreeably affected their ears, was soon presented with the works of Saint Bruno, whom I so zealously admired, and with the voluminous records of the Abbey of Witham. After we had sat extolling them, and talking upon much the same sort of subjects, for about an hour, the Coadjutor proposed a walk amongst the cloisters and galleries, as the weather would not admit of any longer excursion. He leading the way, we ascended a flight of steps, which brought us to a gallery, on each side of which a vast number of pictures, representing the dependent convents, were ranged; for I was now in the capital of the order, where the general resides, and from whence he issues forth his commands to his numerous subjects; who depute the Superiors of their respective convents, whether situated in the wilds of Calabria, the forests of Poland, or in the remotest districts of Portugal and Spain, to assist at the grand chapter, held annually under him, a week or two after Easter. This reverend Father, Dom Biclét, died about ten days before our arrival: a week ago they elected the Père Robinét, prior of the Carthusian convent at Paris, in his room; and two fathers were now on their route to apprise him of their choice, and to salute him General of the Carthusians. During this interregnum the Coadjutor holds the first rank in the temporal, and the Grand Vicaire in the spiritual affairs of the order; both of which are very extensive. If I may judge from the representation of the different convents, which adorn this gallery, there are many highly worthy of notice, for the singularity of their situations, and the wild beauties of the landscapes which surround them. The Venetian Chartreuse, placed in a woody island; and that of Rome, rising from amongst groups of majestic ruins, struck me as peculiarly pleasing. Views of the English monasteries hung formerly in such a gallery, but had been destroyed by fire, together with the old convent. The list only remains, with but a very few written particulars concerning them. Having amused myself for some time with the pictures, and the descriptions the coadjutor gave me of them, we quitted the gallery and entered a kind of chapel, in which were two altars with lamps burning before them, on each side of a lofty portal. This opened into a grand coved hall, adorned with historical paintings of St. Bruno's life, and the portraits of the generals of the order, since the year of the great founder's death (1085) to the present time. Under these portraits are the stalls for the Superiors, who assist at the grand convocation. In front, appears the General's throne; above, hangs a representation of the canonized Bruno, crowned with stars. Were I, after walking along the dim cloisters, and passing through the anti-chapel, faintly illuminated by a solitary lamp, suddenly to enter this hall at midnight, when the convocation is assembled, and the synod of venerable fathers, all in solemn order, surrounding the successor of Bruno, it would be a long while, I believe, before I could recover from the surprise of so august a spectacle. It must indeed be a very imposing sight: the gravity they preserve on these occasions, their venerable age (for Superiors cannot be chosen young), and the figures of their deceased Generals, dimly discovered above, may surely be allowed to awe even an heretical spectator into a momentary respect for the order. For my own part, I must confess that the hall, though divested of all this accompaniment, filled me with a veneration I scarcely knew how to account for; perhaps the portraits inspired it. They were all well executed, and mostly in attitudes of adoration. The form of Bruno was almost lost in the splendours of the stars which hovered over him. I could, in some moments, fancy myself capable of plunging into the horrors of a desert, and foregoing all the vanities and delights of the world, to secure my memory so sublime a consecration. The Coadjutor seemed charmed with the respect with which I looked round on these holy objects; and if the hour of vespers had not been drawing near, we should have spent more time in the contemplation of Bruno's miracles, pourtrayed on the lower panels of the hall. We left that room to enter a winding passage (lighted by windows in the roof) that brought us to a cloister above six hundred feet in length, from which branched off two others, joining a fourth of the same most extraordinary dimensions. Vast ranges of slender pillars extend round the different courts of the edifice, many of which are thrown into gardens belonging to particular cells. We entered one of them: its inhabitant received us with much civility, walked before us through a little corridor that looked on his garden, showed us his narrow dwelling, and, having obtained leave of the Coadjutor to speak, gave us his benediction, and beheld us depart with concern. Nature has given this poor monk very considerable talents for painting. He has drawn the portrait of the late General, in a manner that discovers great facility of execution; but he is not allowed to exercise his pencil on any other subject, lest he should be amused; and amusement in this severe order is a crime. He had so subdued, so mortified an appearance, that I was not sorry to hear the bell, which summoned the Coadjutor to prayers, and prevented my entering any more of the cells. We continued straying from cloister to cloister, and wandering along the winding passages and intricate galleries of this immense edifice, whilst the Coadjutor was assisting at vespers. In every part of the structure reigned the most death-like calm: no sound reached my ears but the "minute drops from off the eaves." I sat down in a niche of the cloister, and fell into a profound reverie, from which I was recalled by the return of our conductor; who, I believe, was almost tempted to imagine, from the cast of my countenance, that I was deliberating whether I should not remain with them for ever. But I soon roused myself, and testified some impatience to see the great chapel, at which we at length arrived after traversing another labyrinth of cloisters. The gallery immediately before its entrance appeared quite gay, in comparison with the others I had passed, and owes its cheerfulness to a large window (ornamented with slabs of polished marble) that admits the view of a lovely wood. Being neatly glazed, and free from paintings or Gothic ornaments, it allows a full blaze of light to dart on the chapel door; which is also adorned with marble, in a plain but noble style of architecture. The father sacristan stood ready on the steps of the portal to grant us admittance; and, throwing open the valves, we entered the chapel and were struck by the justness of its proportions, the simple majesty of the arched roof, and the mild solemn light equally diffused over every part of the edifice. No tawdry ornaments, no glaring pictures disgraced the sanctity of the place. The high altar, standing distinct from the walls, which were hung with a rich velvet, was the only object on which many ornaments were lavished; and even there, the elegance of the workmanship concealed the glare of the materials, which were silver, solid gold, and the most costly gems. It being Whitsunday, this altar was clustered with statues of gold, shrines, and candelabrums of the stateliest shape and most delicate execution. Four of the latter, of a gigantic size, were placed on the steps; which, together with part of the inlaid floor within the choir, were spread with beautiful carpets. The illumination of so many tapers striking on the shrines, censers, and pillars of polished jasper, sustaining the canopy of the altar, produced a wonderful effect; and, as the rest of the chapel was visible only by the faint external light admitted from above, the splendour and dignity of the altar was inconceivable. I retired a moment from it, and seating myself in one of the furthermost stalls of the choir, looked towards it, and fancied it had risen like an exhalation. Here I remained several minutes, breathing nothing but incense with which the air of the whole chapel was impregnated; and, I believe, should not have quitted my station soon, had I not been apprehensive of disturbing the devotions of two aged fathers who had just entered, and were prostrating themselves before the steps of the altar. These venerable figures added greatly to the solemnity of the scene; which as the day declined increased every moment in splendour; for the sparkling of several lamps of chased silver that hung from the roofs, and the gleaming of nine huge tapers which I had not before noticed, began to be visible just as I left the chapel. Passing through the sacristy, where lay several piles of rich embroidered vestments, purposely displayed for our inspection, we regained the cloister which led to our apartment, where the supper was ready prepared. We had scarcely finished it, when the Coadjutor, and the fathers who had accompanied us before, returned, and ranging themselves round the fire, resumed the conversation about St. Bruno. Finding me very piously disposed, by the wonders I had seen in the day, to listen to things of a miraculous nature, they began to relate the inspirations they had received from him, and his mysterious apparitions. I was all attention, respect, and credulity. The old Secretary worked himself up to such a pitch of enthusiasm, that I am very much inclined to imagine he believed in these moments all the miracles he told. The Coadjutor, being less violent in his pretensions to St. Bruno's modern miracles and inspirations, contented himself with enumerating the noble works he had done in the days of his fathers, and in the old time before them. It grew rather late before my kind hosts had finished their narrations, and I was not sorry, after all the exercise I had taken, to return to my cell, where everything invited to repose. I was charmed with the neatness and oddity of my little apartment; its cabin-like bed, oratory, and ebony crucifix; in short, every thing it contained; not forgetting the aromatic odour of the pine, with which it was roofed, floored, and wainscoted. The night was luckily dark. Had the moon appeared, I could not have prevailed upon myself to have quitted her till very late; but, as it happened, I crept into my cabin, and was by "whispering winds soon lulled asleep." Eight o'clock struck next morning before I awoke; when, to my great sorrow, I found the peaks, which rose above the convent, veiled in vapours, and the rain descending with violence. After we had breakfasted by the light of our fire (for the casements admitted but a very feeble gleam), I sat down to the works of St. Bruno; of all medleys, the strangest. Allegories without end; a theologico-natural history of birds, beasts, and fishes; several chapters on paradise; the delights of solitude; the glory of Solomon's temple; the new Jerusalem; and numberless other wonderful subjects, full of enthusiasm and superstition. Saint Bruno was certainly a mighty genius: I admire the motives which drew him to this desert; but perhaps, before coming to that part of the story, you will like to know what preceded it. My Saint (for Bruno has succeeded Thomas of Canterbury) was of noble descent, and possessed considerable wealth. He was not less remarkable for the qualities of his mind, and his talents gained him the degree of Master of the great Sciences in the university of Rheims; here he contracted a friendship with Odo, afterwards Urban the Second. Being always poetical, singular, and visionary, he soon grew disgusted with the world, and began early in life to sigh after retirement. His residence at Grenoble, where he was invited by Hugo, its bishop, determined him to the monastic state. This venerable prelate imparted to him a vision, in which he seemed to behold the desert and mountain beyond his city, visible in the dead of night, by the streaming of seven lucid stars that hung directly over them. Whilst he was ardently gazing at this wonder, a still voice was heard, declaring it the future abode of Bruno; by him to be consecrated, as a retirement for holy men, desirous of holding converse with their God. No shepherd's pipe was to be heard within these precincts; no huntsman's profane feet to tread these silent regions; no woman was to ascend this mountain, nor violate by her allurements the sacred repose of its inhabitants. Such were the first institutions of the order as the inspired Bishop of Grenoble delivered them to Bruno, who selecting a few persons that, like himself, contemned the splendours of the world and the charms of society, repaired with them to this spot; and, in the darkest parts of the forests which shade the most gloomy recesses of the mountains, founded the first convent of Carthusians, long since destroyed. Several years passed away, whilst Bruno was employed in actions of the most exalted piety; and, the fame of his exemplary conduct reaching Rome, (where his friend had been lately invested with the papal tiara,) the whole conclave was desirous of seeing him, and entreated Urban to invite him to Rome. The request of Christ's vice-gerent was not to be refused; and Bruno quitted his beloved solitude, leaving some of his disciples behind, who propagated his doctrines, and tended zealously the infant order. The pomp of the Roman court soon disgusted the rigid Bruno, who had weaned himself entirely from worldly affections. Being wholly intent on futurity, the bustle and tumults of a busy metropolis became so irksome that he supplicated Urban for leave to retire; and, having obtained it, left Rome, and immediately seeking the wilds of Calabria, there sequestered himself in a lonely hermitage, calmly expecting his last moments. Many are the miracles which he wrought, and which his canonized bones have since effected: angels (it is said) hovered round him in his departing hour, and bore him on their wings to heaven. The different accounts of his translation are almost endless; and as they are all, nearly, in the same style, it will be needless to recite them. I had scarcely finished taking extracts from the writings of St. Bruno, when the dinner appeared, consisting of everything most delicate which a strict adherence to the rules of meagre could allow. The good fathers returned as usual with the desert, and served up an admirable dish of miracles, well-seasoned with the devil, and prettily garnished with angels and moonbeams*. Our conversation was interrupted very agreeably, by the sudden intrusion of the sun, which, escaping from the clouds, shone in full splendour above the higher peak of the mountains; and the vapours, fleeting by degrees, discovered the woods in all the freshness of their verdure. The pleasure I received from seeing this new creation rising to view was very lively, and, as the fathers assured me the humidity of their walks did not often continue longer than the showers, I left my hall. Crossing the court, I hastened out of the gates, and running swiftly along a winding path on the side of the meadow, bordered by the forests, enjoyed the charms of the prospect, inhaled the perfume of the woodlands, and now, turning towards the summits of the precipices that encircled this sacred inclosure, admired the glowing colours they borrowed from the sun, contrasted by the dark hues of the forest. Now, casting my eyes below, I suffered them to roam from valley to valley, and from one stream (beset with tall pines and tufted beech trees) to another. The purity of the air in these exalted regions, and the lightness of my own spirits, almost seized me with the idea of treading in that element. Not content with the distant beauties of the hanging rocks and falling waters, I still kept running wildly along, with an eagerness and rapidity that, to a sober spectator, would have given me the appearance of one possessed; and with reason, for I was affected with the scene to a degree I despair of expressing. Whilst I was continuing my course, pursued by a thousand strange ideas, a father, who was returning from some distant hermitage, stopped my career, and made signs for me to repose myself on a bench erected under a neighbouring shed; and, perceiving my agitation and disordered looks, fancied, I believe, that one of the bears that lurk near the snows of the mountains had alarmed me by his sudden appearance. The good old man, expressing by his gestures that he wished me to recover myself in quiet on the bench, hastened, with as much alacrity as his age permitted, to a cottage adjoining the shed, and returning in a few moments, presented me some water in a maple cup, into which he let fall several drops of an elixir composed of innumerable herbs, and having performed this deed of charity, signified to me by a look, in which benevolence, compassion, and perhaps some little remains of curiosity were strongly painted, how sorry he was to be restrained by his vow of silence from enquiring into the cause of my agitation, and giving me farther assistance. I answered also by signs, on purpose to carry on the adventure, and suffered him to depart with all his conjectures unsatisfied. No sooner had I lost sight of the benevolent hermit than I started up, and pursued my path with my former agility, till I came to the edge of a woody dell, that divided the meadow, on which I was running, from the opposite promontory. Here I paused, and looking up at the cliffs, now but faintly illumined by the sun, which had been some time sinking on our narrow horizon, reflected that it would be madness to bewilder myself, at so late an hour, in the mazes of the forest. Being thus determined, I abandoned with regret the idea of penetrating into the lovely region before me, and contented myself for some moments with marking the pale tints of the evening gradually overspreading the cliffs, so lately flushed with the gleams of the setting sun. But my eyes were soon diverted from contemplating these objects by a red light streaming over the northern sky, which attracted my notice as I sat on the brow of a sloping hill, looking down a steep hollow vale, surrounded by the forests, above which rose majestically the varied peaks and promontories of the mountains. The upland lawns, which hang at immense heights above the vale, next caught my attention. I was gazing alternately at them and the valley, when a long succession of light misty clouds, of strange fantastic shapes, issuing from a narrow gully between the rocks, passed on, like a solemn procession, over the hollow dale, midway between the stream that watered it below, and the summits of the cliffs on high. The tranquillity of the region, the verdure of the lawn, environed by girdles of flourishing wood, and the lowing of the distant herds, filled me with the most pleasing sensations. But when I lifted up my eyes to the towering cliffs, and beheld the northern sky streaming with ruddy light, and the long succession of misty forms hovering over the space beneath, they became sublime and awful. The dews which began to descend, and the vapours which were rising from every dell, reminded me of the lateness of the hour; and it was with great reluctance that I turned from the scene which had so long engaged my contemplation, and traversed slowly and silently the solitary meadows, over which I had hurried with such eagerness an hour ago. Hill appeared after hill, and hillock succeeded hillock, which I had passed unnoticed before. Sometimes I imagined myself following a different path from that which had brought me to the edge of the deep valley. Another moment, descending into the hollows between the hillocks that concealed the distant prospects from my sight, I fancied I had entirely mistaken my route, and expected every moment to be lost amongst the rude brakes and tangled thickets that skirted the eminences around. As the darkness increased, my situation became still more and more forlorn. I had almost abandoned the idea of reaching the convent; and whenever I gained any swelling ground, looked above, below, and on every side of me, in hopes of discovering some glimmering lamp which might indicate a hermitage, whose charitable possessor, I flattered myself, would direct me to the monastery. At length, after a tedious wandering along the hills, I found myself, unexpectedly, under the convent walls; and, as I was looking for the gate, the attendant lay-brothers came out with lights, in order to search for me; scarcely had I joined them, when the Coadjutor and the Secretary came forwards, with the kindest anxiety expressed their uneasiness at my long absence, and conducted me to my apartment, where Mr ----- was waiting, with no small degree of impatience; but I found not a word had been mentioned of my adventure with the hermit; so that, I believe, he strictly kept his vow till the day when the Carthusians are allowed to speak, and which happened after my departure. We had hardly supped before the gates of the convent were shut, a circumstance which disconcerted me not a little, as the full moon gleamed through the casements, and the stars sparkling above the forests of pines, invited me to leave my apartment again, and give myself up entirely to the spectacle they offered. The Coadjutor, perceiving that I was often looking earnestly through the windows, guessed my wishes, and calling the porter, ordered him to open the gates, and wait at them till my return. It was not long before I took advantage of this permission, and escaping from the courts and cloisters of the monastery, all hushed in stillness, ascended a green knoll, which several ancient pines marked with their fantastic shadows: there, leaning against one of their trunks, I lifted up my eyes to the awful barrier of surrounding mountains, discovered by the trembling silver light of the moon shooting directly on the woods which fringed their acclivities. The lawns, the vast woods, the steep descents, the precipices, the torrents, lay all extended beneath, softened by a pale blueish haze, that alleviated, in some measure, the stern prospect of the rocky promontories above, wrapped in dark shadows. The sky was of the deepest azure, innumerable stars were distinguished with unusual clearness from this elevation, many of which twinkled behind the fir-trees edging the promontories. White, grey, and darkish clouds came marching towards the moon, that shone full against a range of cliffs, which lift themselves far above the others. The hoarse murmur of the torrent, throwing itself from the distant wildernesses into the gloomy vales, was mingled with the blast that blew from the mountains. It increased. The forests began to wave, black clouds rose from the north, and, as they fleeted along, approached the moon, whose light they shortly extinguished. A moment of darkness succeeded; the gust was chill and melancholy; it swept along the desert, and then subsiding, the vapours began to pass away, and the moon returned; the grandeur of the scene was renewed, and its imposing solemnity was increased by her presence. Inspiration was in every wind. I followed some impulse which drove me to the summit of the mountains before me; and there, casting a look on the whole extent of wild woods and romantic precipices, thought of the days of St. Bruno. I eagerly contemplated every rock that formerly might have met his eyes; drank of the spring which tradition says he was wont to drink of; and ran to every pine, whose withered appearance bespoke the most remote antiquity, and beneath which, perhaps, the saint had reposed himself, when worn with vigils, or possessed with the sacred spirit of his institutions. It was midnight; the convent bell tolled; for the most solemn hour of prayer was arrived. I cannot, nor would I, attempt to unfold to you, in prose, half the strange things of which I thought, and which I seemed to see, during this wild excursion. However, I owe to it the poetical humour in which I composed the following lines, written, immediately on my return, in the Album of the fathers, during the stillest watch of night. Quick fled the moon, and sudden stillness reign'd. A saintly figure, pale, in pensive mood. Say did not whisp'rings strange arrest thine ear? Where sole the friend of Nature loves to roam. To win my chosen sons immortal health. To Nature, Silence, and Herself consignd. But all, mark well my parting voice! Sage lessons here may learn of high import. And bear, amidst the world, the hermit's heart. Know, Bruno brings it, and returns no more." He turn'd, and vanish'd in the bright'ning dell. My imagination was too much disturbed, and my spirits far too active, to allow me any rest for some time; and I had not long been quieted by sleep, when I was suddenly awakened by a furious blast, that drove open my casement, and let in the roar of the tempest, for the night was troubled. In the intervals of the storm, in those moments when the winds seemed to pause, the faint sounds of the choir stole upon my ear; but were swallowed up the next instant by the redoubled fury of the gust, which was still increased by the roar of the waters. I started from my bed, closed the casement, and composed myself as well as I was able; but no sooner had the sunbeams entered my window, than I arose, and gladly leaving my cell, breakfasted in haste, and hurried to the same knoll, where I had stood the night before. The storm was dissipated, and the pure morning air delightfully refreshing: every tree, every shrub, glistened with dew. A gentle wind breathed upon the woods, and waved the fir-trees on the cliffs, which, free from clouds, rose distinctly into the clear blue sky. I strayed from the knoll into the valley between the steeps of wood and the turrets of the convent, and passed the different buildings, destined for the manufacture of the articles necessary to the fathers; for nothing is worn or used within this inclosure, which comes from the profane world. Traversing the meadows and a succession of little dells, where I was so lately bewildered, I came to a bridge thrown over the torrent, which I crossed; and here followed a slight path that brought me to an eminence, covered with a hanging wood of beech-trees, feathered to the ground; from whence I looked down the narrow pass towards Grenoble. Perceiving a smoke to arise from the groves which nodded over the eminence, I climbed up a rocky steep, and, after struggling through a thicket of shrubs, entered a smooth, sloping lawn, framed in by woody precipices; at one extremity of which I discovered the cottage, whose smoke had directed me to this sequestered spot; and, at the other, a numerous group of cattle, lying under the shade of some beech-trees, whilst several friars, with long beards and russet garments, were employed in milking them. The luxuriant foliage of the woods, clinging round the steeps that skirted the lawn; its gay, sunny exposition; the groups of sleek, dappled cows, and the odd employment of the friars, so little consonant with their venerable beards, formed one of the most singular, and at the same time one of the most picturesque spectacles that had, perhaps, ever offered itself to, my sight. I, who had been accustomed to behold "milk-maids singing blithe," and tripping lightly along with their pails, was not a little surprised at the silent gravity with which these figures shifted their trivets from cow to cow; and it was curious to see with what adroitness they performed their functions, managing their long beards with a facility and cleanliness equally admirable. I watched all their movements for some time, concealed by the trees, before I made myself visible; but no sooner did I appear on the lawn, than one of the friars quitted his trivet, very methodically set down his pail, and coming towards me with an open, smiling countenance, desired me to refresh myself with some bread and milk. A second, observing this motion, was resolved not to be exceeded in an hospitable act, and, quitting his pail too, hastened into the woods, from whence he returned in a few minutes with some strawberries, very neatly enveloped in fresh leaves. These hospitable, milking fathers, next invited me to the cottage, whither I declined going, as I preferred the shade of the beeches; so, reclining myself on the soft herbage, I enjoyed the scene and its productions with all possible glee. Not a cloud darkened the heavens; every object smiled; innumerable gaudy flies glanced in the sunbeams that played in a clear spring by the cottage; I saw with pleasure the sultry glow of the distant cliffs and forests, whilst indolently reclined in the shade, listening to the summer hum; one hour passed after another neglected away, during my repose in this most delightful of valleys. The cattle were all slunk into the recesses of the woods, and were drinking at the streams which flow along their shades, before I could prevail on myself to quit the turf and the beech-trees. Never shall I cease regretting the peaceful moments I spent in Valombré, as never perhaps, were I even to return to it, may so many circumstances unite to render it pleasing. When I returned, unwillingly, to the convent, the only topic on which I could converse was the charms of Valombré; but notwithstanding the indifference with which I now regarded the prospects that surrounded the monastery, I could not disdain an offer made by one of the friars, of conducting me to the summit of the highest peak of the desert. Pretty late in the afternoon I set out with my guide, and, following his steps through many forests of pine, and wild apertures among them, strewed with fragments, arrived at a chapel, built on a mossy rock, and dedicated to St. Bruno. Having once more drunk of the spring that issues from the rock on which this edifice is raised, I moved forwards, keeping my eyes fixed on a lofty green mountain, from whence rises a vast cliff, spiring up to a surprising elevation; and which (owing to the sun's reflection on a transparent mist hovering around it) was tinged with a pale visionary light. This object was the goal to which I aspired; and redoubling my activity, I made the best of my way over rude ledges of rocks, and crumbled fragments of the mountain, interspersed with firs, till I came to the green steeps I had surveyed at a distance. These I ascended with some difficulty, and, leaving a few scattered beech-trees behind, in full leaf, shortly bade adieu to summer, and entered the regions of spring; for, as I approached that part of the mountain next the summit, the trees, which I found there rooted in the crevices, were but just beginning to unfold their leaves, and every spot of the greensward was covered with cowslips and violets. After taking a few moments' repose, my guide prepared to clamber amongst the rocks, and I followed him with as much alertness as I was able, till laying hold of the trunk of a withered pine, we sprang upon a small level space, where I seated myself, and beheld far beneath me the vast desert and dreary solitudes, amongst which appeared, thinly scattered, the green meadows and hanging lawns. The eye, next overlooking the barrier of mountains, ranged through immense tracts of distant countries; the plains where Lyons is situated; the woodlands and lakes of Savoy; amongst which that of Bourget was near enough to discover its beauties, all glowing with the warm haze of the setting sun. My situation was too dizzy to allow a long survey, so turning my eyes from the terrific precipice, I beheld an opening in the rocks, through which we passed into a little irregular glen of the smoothest greensward, closed in on one side by the great peak, and on the others by a ridge of sharp pinnacles, which crown the range of white cliffs I had so much admired the night before, when brightened by the moon. And purpled all the ground with vernal flow'rs. My guide, perceiving I was ready to mount still higher, told me it would be in vain, as the beds of snow that lie eternally in some fissures of the mountain, must necessarily impede my progress; but, finding I was very unwilling to abandon the enterprise, he showed me a few notches in the peak, by which we might ascend, though not without danger. This prospect rather abated my courage, and the wind, rising, drove several thick clouds round the bottom of the peak, which increasing every minute, shortly skreened the green mountain and all the forests from our sight. A sea of vapours soon undulated beneath my feet, and lightning began to flash from a dark angry cloud that hung over the valleys and, probably, deluged them with storms, whilst I was securely standing under the clear expanse of æther. But the hour did not admit of my remaining long in this proud station; so, descending, I was soon obliged to pass through the vapours, and, carefully following my guide (for a false step might have caused my destruction) wound amongst the declivities, till we left the peak behind, and just as we reached the green mountain which was moistened with the late storm, the clouds fleeted and the evening recovered its serenity. Leaving the chapel of St. Bruno on the right, we entered the woods, and soon emerged from them into a large pasture, under the grand amphitheatre of mountains, having a gentle ascent before us, beyond which appeared the neat blue roofs and glittering spires of the convent, where we arrived as the moon was beginning to assume her empire. I need not say I rested well after the interesting fatigues of the day. The next morning early, I quitted my kind hosts with great reluctance. The Coadjutor and two other fathers accompanied me to the outward gate, and there within the solemn circle, of the desert bestowed on me their benediction. It seemed indeed to come from their hearts. They were not even contented with going thus far, they would not leave me till I was an hundred paces from the convent; and then, laying their hands on their breasts, declared that if ever I was disgusted with the world, here was an asylum. I was in a melancholy mood when I traced back all the windings of my road, and when I found myself beyond the last gate, in the midst of the wide world again, it increased. We returned to Les Eschelles; from thence to Chamberry, and, instead of going through Aix, passed by Annecy; but nothing in all the route engaged my attention, nor had I any pleasing sensations till I beheld the glassy lake of Geneva, and its lovely environs. I rejoiced then, because I knew of a retirement on its banks, where I could sit and think of Valombré. * Angels are frequently represented, in legendary tales, as riding on the beam; of the moon.